February Current Affairs. Important Current Affairs Questions – 5th February 2019. Daily Important Current Affairs. Daily Current Affairs PDF. Welcome to the www.letsstudytogether.co online Current Affairs section. If you are preparing for IBPS PO/Clerk, Canara Bank PO, banking & Insurance, SSC , Railways and other competitive exams, you will come across a section on the Current Affairs. Here we are providing you “Important G.K. & Current Affairs Questions “ in PDF format based on the current events for your daily practice. 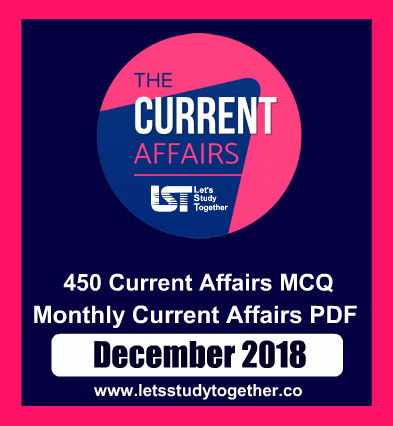 This “Important Current Affairs Questions – February 2019″ is also important for other banking exams such as IBPS PO, IBPS Clerk, SBI PO/Clerk, IBPS RRB Officer, IBPS RRB Office Assistant, IBPS SO, SBI SO, SSC , Railways and other competitive exams. 1._________ won its first major soccer title by beating four-time champion Japan 3-1 in the Asian Cup final. Explanation: Qatar won its first major soccer title by beating four-time champion Japan 3-1 in the Asian Cup final on Friday, completing an improbable run to glory for the Gulf nation as it prepares to host the 2022 World Cup. After upsetting one of the tournament favorites, players wrapped themselves in Qatari flags in a display of patriotic furor that will have resonated far beyond the field in Abu Dhabi. 2. Sikkim & _________ entered into a pact for revamping the state’s education system by enhancing digital literacy and building new age tech capacity among students and faculty in government-run schools. Explanation: The Sikkim government and Microsoft India entered into a pact for revamping the state’s education system by enhancing digital literacy and building new age tech capacity among students and faculty in government-run schools. The MoU was signed between the Human Resource Development Department and the technology major. As part of the collaboration, Microsoft will support the state in integration of IT content in the state board curriculum to build student capacity, usher in school reforms, build teacher capacity as well as enhance digital literacy and digital citizenship. 3. World Wetlands Day is observed annually on __________. Explanation: World Wetlands Day occurs annually on February 2nd, marking the date of the adoption of the Convention on Wetlands on February 2, 1971. Established to raise awareness about the value of wetlands for humanity and the planet, WWD was celebrated for the first time in 1997 and has grown remarkably since then. Each year, government agencies, non-governmental organizations, and groups of citizens at all levels of the community, have taken advantage of the opportunity to undertake actions aimed at raising public awareness of wetland values and benefits. Some of these benefits include: biologically diverse ecosystems that provide habitat for many species, serve as buffers on the coast against storms and flooding, and naturally filter water by breaking down or transforming harmful pollutants. 4.Country’s biggest cultural event, Kala Ghoda Arts Festival (KGAF) has kick-started in ________. Explanation: Country’s biggest cultural event, Mumbai’s Kala Ghoda Arts Festival (KGAF) has kickstarted from 2nd February, 2018. This year is going to be the 20th edition of the biggest street art festival that brings together artists, art lovers and trailblazers of visual culture from all over the world. One of the foremost art and culture events of the country, Kala Ghoda Arts Festival offers a combination of art, culture, cinema, theatre, and music, giving way to an international discourse on new thoughts and ideas. The most awaited art festival of the country is going to be organized from February 2nd to February 10th, 2018. 5. 30th Road Safety Week 2019 will be celebrated in India from __________. Explanation: 30th Road Safety Week 2019 will be celebrated in India from 04th February (Monday) to the 10th February (Sunday). India observed its 29th Road Safety Week from 23rd to 30th April 2018, under the guidelines of Ministry of Road Transport and Highways and National Security council. The event was marked with awareness raising campaigns and fund raising for NGOs working for road safety. The ministry also announced financial assistance to the organizations working for road safety. 6.The National Day of Sri Lanka is celebrated on _________. Explanation: The National Day of Sri Lanka is celebrated on 4 February to commemorate its internal political independence from British rule on that day in 1948. The day is a national holiday in Sri Lanka. It is celebrated all over the country through flag-hoisting ceremony, dances, parades and performances. Usually, the main celebration takes place in Colombo, where the President raises the national flag and delivers a nationally televised speech. Many national struggles were made in the history of Sri Lanka. And on the independence day all of these are remembered and celebrated. But the independence movement against the British is especially recalled. 7. The government recently increased the sports budget by over _____ rupees for the next financial year. Explanation: The government recently increased the sports budget by over 214 crore rupees for the next financial year, including a hike in funds for the Sports Authority of India (SAI) and incentives for sports persons. In the interim budget presented by Finance Minister Piyush Goyal, the overall sports budget for 2019-2020 was increased from 2002 crore rupees to 2216. 8. Who recently took charge as managing director and CEO of public-sector lender Corporation Bank? Explanation: Canara Bank executive director P V Bharathi on Friday took charge as managing director and CEO of public-sector lender Corporation Bank, the bank said in a statement. A graduate in Science and a Bachelor of Education, Bharathi completed her Masters in Arts (Economics). she is a certified associate of Indian Institute of Bankers and has done an integrated course on banking & finance from NIBM, Pune. 9. The European Parliament recognised Venezuela’s self-declared interim president ____________ as de facto head of state recently. Explanation: The European Parliament recognised Venezuela’s self-declared interim president Juan Guaido as de facto head of state on Thursday, heightening international pressure on the OPEC member’s socialist President Nicolas Maduro. EU governments, divided over whether to recognise Guaido, also agreed to lead an international crisis group with South American nations to seek new elections, setting a 90-day time limit, and threatening further economic sanctions. 10. The state-run Indian Space Research Organisation (ISRO) has recently unveiled a Human Space Flight Centre at the ISRO headquarters in __________. Explanation: The state-run Indian Space Research Organisation (ISRO) said it has unveiled a Human Space Flight Centre at the ISRO headquarters in Bengaluru. “Human Space Flight Centre is operational now. The facility is next to ISRO headquarters,” the city-based space agency tweeted. The Centre is dedicated to developing critical technologies for human space missions. 11.______ opened a new centre set up by the government in partnership with the UN to fight climate change and boost sustainable development in Africa. Explanation: Italian Prime Minister Giuseppe Conte has opened a new centre here set up by the government in partnership with the UN to fight climate change and boost sustainable development in Africa. The new centre is located near the headquarters of the Food and Agriculture Organisation (FAO) in central Rome. It will help develop and scale-up innovative solutions for sustainable development, implement the goals of the UN’s 2030 Agenda and the landmark 2015 Paris Climate Agreement to end reliance on fossil fuels and cap global warming. 12. Who among the following assumed the charge as Director General of Police (DGP), Haryana? Explanation: KP Singh, IPS Officer of 1985 batch, assumed the charge as Director General of Police (DGP), Haryana. After the retirement of DGP BS Sandhu on January 31, the State Government has given the charge of DGP to KP Singh, DG Haryana Human Rights Commission, in addition to his present duty. 13.__________ became the first Indian to earn a card for the Australian Ladies PGA Tour (LPGA). Explanation: Vani Kapoor became the first Indian to earn a card for the Australian Ladies PGA Tour (LPGA) after coming through its first-ever Qualifying Tournament at the Ballarat Golf Club in Ballarat, Australia. 14.Germany, France and the UK have set up a payment channel with ____ called INSTEX, to help continue trade and circumvent US sanctions. Explanation: Germany, France and the UK have set up a payment channel with Iran called INSTEX, to help continue trade and circumvent US sanctions. Brussels hopes the long-awaited special payment system will help save the Iran nuclear deal by allowing Tehran to keep trading with EU companies despite Washington reimposing sanctions after US President Donald Trump abruptly quit the accord last year. 15.Which among the following teams won the Regetta trophy in the Kochi Area Pulling Regatta 2019 of the Southern Naval Command (SNC)? Explanation: INS Dronacharya team won the Regetta trophy in the Kochi Area Pulling Regatta 2019 of the Southern Naval Command (SNC) held in the Ernakulam Channel. The Boat Pulling Regatta is one of the most prestigious and traditional naval sporting activities conducted by the Navy.